A Pastor's Thoughts (Fr. Ed Namiotka): Seeking "Truth"
Democrats or Republicans? Devin Nunes or Adam Schiff? CNN or Fox News? Judge Kavanaugh or Dr. Ford? Archbishop Vigano or Pope Francis? Whom should I believe? There’s a tremendous amount of confusion circulating today. My head continues to throb daily as I, like many people, question and seek out the truth. 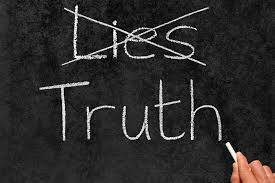 Pilate once questioned Jesus as He stood before him in judgment: What is truth? (Jn. 18: 38) It seems we are still looking for the answer to this question. Going back to my days as a philosophy major in college, truth is defined as the conformity of the mind to reality. Jesus declared himself to be the way, the truth and the life. (Jn. 14:6) If we believe that Jesus is the Son of God Incarnate, then we had better pay close attention to Him and His teaching. Contrast this with Satan who is seen as the father of lies and we can begin to see the battle lines being drawn. Lies and deception can potentially take place in any situation, circumstance and institution—unfortunately, even in the Catholic Church. That is how we find ourselves in cover-ups and scandals. The reason why a person traditionally was sworn in (with a hand on the bible) when giving testimony or taking an oath of office is to call God as a witness to what is being said “so help me God.” When someone lies under oath, this is seen as committing the crime/sin of perjury. Unfortunately, oaths and vows before God apparently are not taken too seriously anymore by far too many. Married couples walk away from their marriage vows exchanged with each other before God. Priests and religious are seen breaking their promises/vows of celibacy or chastity. While people my not admit to lying under oath, they may have lapses of memory, inadequate recall or parse words or phrases. “It depends on what the meaning of the word ‘is’ is.” Sound familiar? When no wrong is done, there is absolutely nothing to hide. There is no need for continual silence, stalling tactics, deflection, or cover-ups. This is true in politics, church management, and in a person’s personal life and morality. To the faithful Catholics in the pews, I predict the days ahead will get even more ugly as hidden things are brought to light with ongoing investigations state by state. While the Catholic Church is the current focus, the deep secrets of many other institutions will no doubt reveal universal sins/crimes and cover-ups as was the case recently in Australia (see the Royal Commission into Institutional Responses to Child Sexual Abuse). Jesus and His Church will endure in the end. He promised it would. (See Mt. 16: 17-19) However, it can be relatively certain that there will be many battle scars and casualties.